Instructions: Cut a piece of white cardstock 10" x 7", score at 5" and fold to create a base card of 5" x 7". Cut a piece of patterned paper 5" x 7". Die cut the frame from the centre of the paper using the inner frame die from the HCD1-7202 Album Tags & Accents Die set. Die cut a frame out of gold mirror cardstock using the inner and outer frame dies and adhere to the frame. Adhere the outer frame to the card base using foam tape. Recess the centre of the frame in the middle. Die cut the outer eyelet label from gold mirror cardstock. Die cut the coordinating label from the paper collection using the inner plain edge die. Stamp the sentiment from the HCPC-3843 Special Birthday Sentiments Stamp set in Plum ink and adhere the inner label to the gold label and adhere this to the centre of the frame with foam tape. Add Nuvo Pure Sheen Glitter - Diamond to the corset image with Dries Clear glue. Die cut two small corners from gold mirror card and adhere to the right side corners. Stamp the leaf images from the HCPC-3835 Leafy Accents Stamp set in Library Green ink on Iris cardstock. Colour with the Leaf Green, Fern Green and Magenta Hue inks and die cut with the coordinating dies. Shape using the coordinating mold and add Crystal Clear glitter using Dries Clear glue on a damp sponge. Add the leaves to the bottom left of the card around the label. Stamp the rose images from HCPC-3752 Classic Rose Stamp set in Magenta Hue ink on Iris cardstock. Colour with Magenta Hue ink and die cut with the coordinating die. 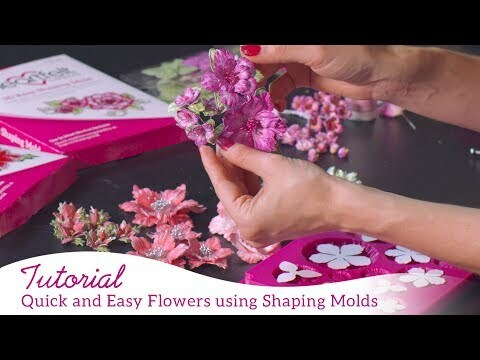 Shape using the coordinating flower shaping mold and assemble when dry. Add Crystal Clear glitter using Dries Clear glue on a damp sponge. 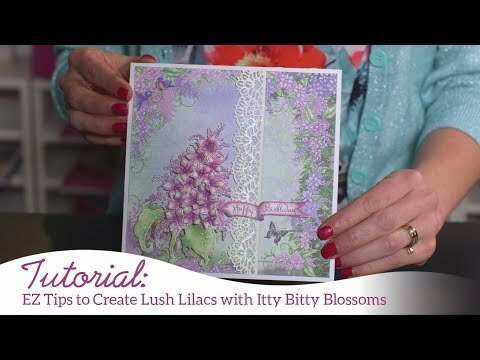 Add the roses over the leaves on the bottom right of the card. Stamp the leaf images from the HCPC-3811 Rainboots and Blossoms Stamp set in Fern Green ink on Iris cardstock. 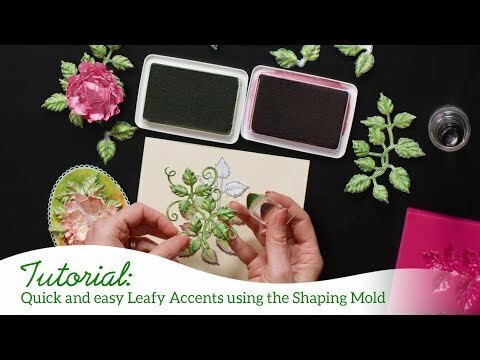 Colour with Leaf Green ink and die cut with the coordinating die. Shape and adhere around the roses. Stamp the Lilac images from HCPC-5816 Lush Lilac Stamp set in Versamark ink on vellum and emboss with white embossing powder. 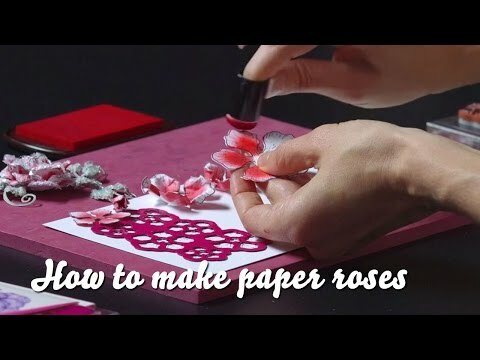 Colour the flowers with Magenta Hue ink and die cut with the coordinating die. Shape using the coordinating mold. Pierce the centre of the flowers and thread the small gold stamens through and secure with Dries Clear glue. Add the Diamond Sprinkles glitter using Dries Clear glue on a damp sponge. Trim the threads and adhere around the roses as shown.